Every year, I hold a studio show in October in my Soquel art studio. 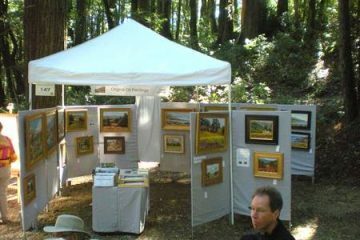 Visitors can see my recent paintings, as well as my variety of tools, brushes, lights, and other equipment of various sorts. I describe my painting process, and sometimes do demonstrations. A fun recent addition to the show is that I hold a drawing for a small painting, a print, and a pack of note cards – and all studio visitors can enter. Winners are chosen randomly from all who fill out a card at my studio during the October art tour. 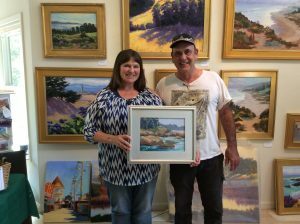 The third prize of a pack of note cards went to Molly in Santa Cruz and the second prize of a fine art print went to Yvonne of Aptos. 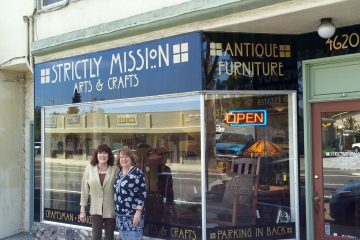 This year Cove in Fog was the Grand Prize won by Carol from Soquel! Most of those who filled out a card also voted for their favorite painting. The large paintings always steal the show, and many votes went to Coastal Muse, 24”x36”, the largest painting from the Pescadero series that I worked on during the year. 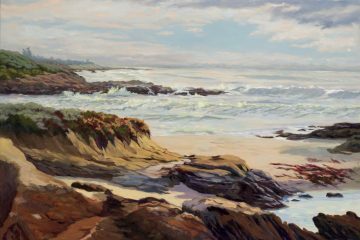 The second vote getter was Wildflower Summer, a 24″x18″ vertical of the Pescadero beach. 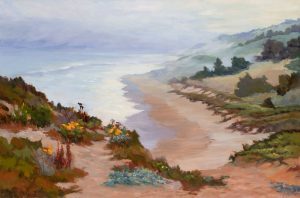 Several other large paintings came in third place with about the same number of votes: Eucalyptus Shadows, Sea Lavender, Misty Beach, and Coastal Spring. 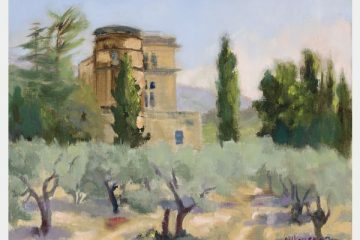 You can view these in the Coastal Landscapes and Studio Paintings sections of my portfolio. Votes were far ranging in subject matter which attests to our unique visual palates as individuals. 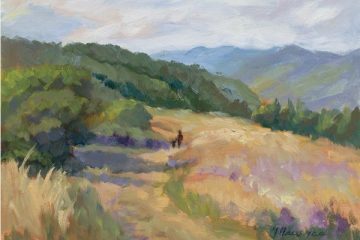 Among the smaller pieces chosen as a favorite by several were: Vineyard Harvest 12×16 (which was in progress on my easel and almost completed), La Honda Creek Preserve 12×16 in the walnut frame, and Mustard Fields 9×12. They all received the same number of votes. I’m always very interested to know what imagery my visitors are drawn to, and I am always looking for new subjects and locales to inspire me. Let me know if you have a special place that you would like to see painted.